It was the middle of the 2014 season and I was in Montgomery Alabama and I really started to struggle. So they sent me down to high A and I still struggled. That's when they asked me to try it and I've been doing it since. I would have to say the biggest advantage is movement of the ball. You get a lot more ground ball outs and hitters aren't used to that angle. I had a lot of success conventionally but I always struggled to get lefties out. Now I don't have that problem. I think everything happens for a reason so I'm glad it timed up the way it did. Give it a try if they can't get outs over the top! I would say to not worry about mechanics because there isn't a right way to do it. Find what's comfortable and the rest is trial and error. 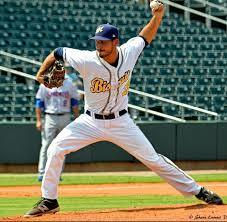 Righties I throw from the right side of the mound and I'm primarily fb, change up with the occasional surprise slider. Lefties I'm on the left side to have a better angle and I throw fb, slider. A lot of sliders to lefties though! I would have to say getting left handed hitters out and getting to be different than everyone else.